Bosch has come out with some news blades that should really make a lot of people happy. First up is the long awaited stainless steel blade. Anyone who has had to cut stainless steel knows how hard it is to cut with a standard bi-metal blade. You could only get a few cuts out of one blade before it was useless, and that was even while using cutting oil. 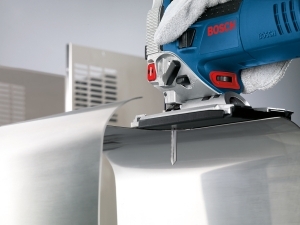 The new stainless steel blade from Bosch has an 8% cobalt steel additive, which increases heat and wear resistance. It is also recommended that you use cutting oil on the surface to reduce heat build-up, and the tool should be in the non-orbital mode running at less the 1,500 strokes per minute. They are available in 18-TPI for 8 to 16 gauge steel and 36-TPI for thinner steel, from 16 to 26 gauge. Next up is the Bosch Extra Clean for Wood jigsaw blade. What makes these blades different then your standard blade is the fact that they cut on both the up, and down stroke. Most blades cut in only one direction, leaving the opposite side of the material vulnerable to chipping or splintering. The Bosch patented tooth design has a scalpel tooth to produce clean cuts on the bottom, and a pointed tooth to cut the top. The Extra Clean for Wood blade is ideally suited for fine woodworkers, cabinet makers, or finish carpenters . You can visit Bosch Tools to find a dealer near you.